Myopia Treatment: You may sometimes find it difficult to read things that are at a little distance from you! The condition is identified as myopia in medical terms and should never be taken casually, being a progressive disorder. Myopia can be referred to as a nearsightedness is generally expressed with the symptoms like squinting, eye strain, headaches that may lead to blurry central vision. The condition can be very common and generally be managed with the help of contact lenses or glasses. Although myopia, if not cured or managed within initial time frame, the pathological myopia may lead to degenerative eye disorders, such as retinal detachment or glaucoma. Unfortunately, more and more people are being affected by the nearsightedness and the reason behind it is not well proved. Many eye doctors answer that it might have something to do with eye fatigue from computer use and other extended near vision tasks, coupled with a genetic predisposition for myopia. 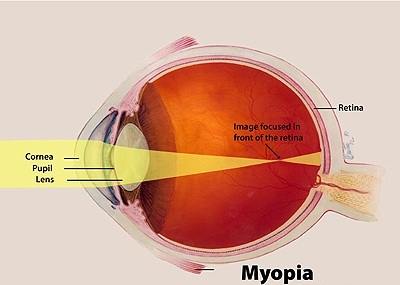 Myopia occurs when the eyeball is too long, in comparison to the focusing power of the cornea and lens of the eye. This causes light rays to focus at a point in front of the retina, rather than directly on its surface. Nearsightedness also can be caused by the cornea and lens being too curved for the length of the eyeball. In some cases, myopia is due to a combination of these factors. The over stretching of retina can cause it to be thinner, leading to the retinal atrophy. The areas of retina that have been thinned down can affect the structural as well as functional integrity of eye due to major cellular loss. The condition can be judged with pale look of the retina and visibly apparent blood vessels behind the retina. If the condition is ignored for a longer period of time, it may lead to blind patches or sight loss. Lattice regeneration can be attributed to the thinning of certain parts of the retina, preferably at the edge; the cause of which is yet to be identified. Some specialists think it to be because of dryness or harmful sunrays, and hence offer laser therapy and/or cryotherapy in order to prevent further progression to retinal detachment. In some people new blood vessels can grow underneath the retina, generally referred to as neovascularization. It is to be noted that these vessels are very tiny as well as fragile that are susceptible to the leakage; causing retinal damage and swelling. The traditional treatment approach is not successful in reversing the damage to the tissue; but with the great progress in the field of stem cells, it is now possible to bring back the normal vision using easy and natural process. Stem cells are the naive cells of the body, which are able to differentiate into many types of cells if directed through proper channel. Thus, stem cells isolated from your own tissues such as bone marrow or adipose tissues can be channelized to be corneal cells, photoreceptor cells, optic nerves, muscle cells etc. in the eye to regain its normal function back.